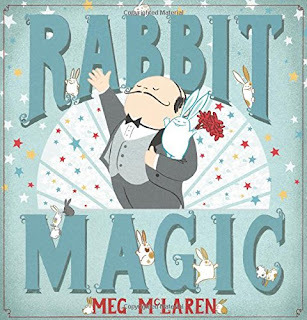 When a magic trick goes awry, the famed magician M. Lapin is transformed into one very sad rabbit while his rabbit assistant, Houdini, becomes the star of the show. After trying increasingly spectacular tricks, Houdini realizes that someone else wants and deserves the spotlight...will he be able to restore M. Lapin to his former glory? So, so great—this was definitely one of those I-passed-it-on-display-in-the-library-and-judged-it-by-its-cover-and-grabbed-it. Totally lived up to its cover, man. Just look at all of those adorable bunnies! Okay, but really, it's a good one. The illustrations, in particular, are what carry the book—it could almost be a wordless picture book. They're soft, full of emotion, little side stories, and perfect for pouring over. The story itself is cute, and while I wasn't necessarily wowed or laughed my head off, it definitely put a smile on my face. It reminded me a bit of a Pixar short (yes, the magician one, obviously) because of its great visual storytelling. Though it may be a bit harder to read in a large-audience setting (you need to see the pictures! ), I'd still recommend it. Give it a try! "Who says adults can't have fun? This book explores 100 of the coolest, wackiest, and most amazing jobs and careers out there, from astronaut to zookeeper, ice cream taster to game maker. 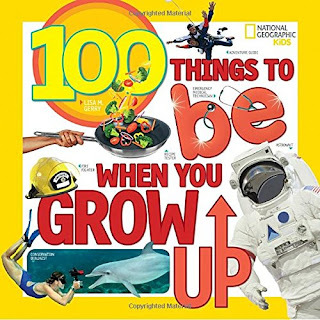 "Jam-packed with inspiration, hands-on projects, advice from National Geographic explorers, interviews with experts, weird-but-true facts, and more, this new book in the popular "100 Things" series is a great way to get kids thinking creatively about career paths and excited about their futures!" I'm not gonna lie, I got pretty sucked into this book the minute it came into my hands. It's so fascinating! I just wanted to keep turning pages to see what other whacked out careers I've been missing out on. And while I might be a tad disappointed "librarian" is not in this list, it's obvious that this book will be a winner with the kids. There are lots of big and bold photographs, plenty of factual asides, and colorful graphics. The untraditional format makes it easy to flip around; no need to read front to back (the index at the end helps keep it relatively organized, though). It's a fun one. I don't know that all of the careers are totally practical (e.g. professional bridesmaid, mermaid, emoji artist) but I guess that's what keeps it fun. 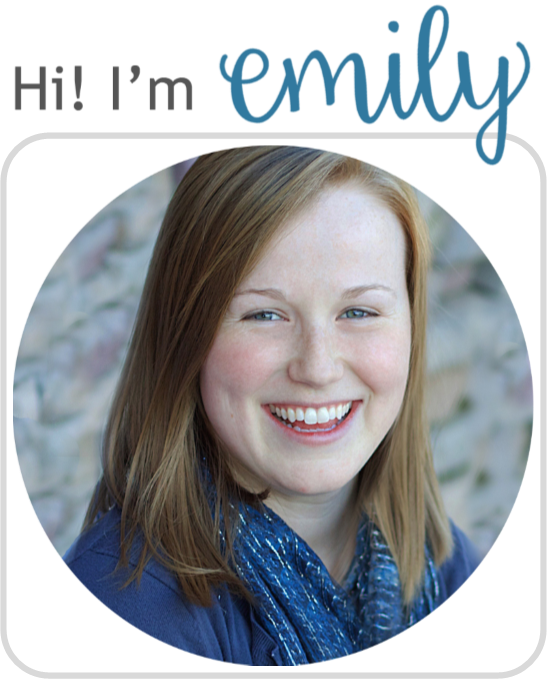 "Ever since she was a baby, the words people use to describe Elyse have instantly appeared on her arms and legs. 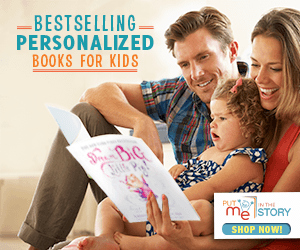 At first it was just "cute" and "adorable," but as she's gotten older and kids have gotten meaner, words like "loser" and "pathetic" appear, and those words bubble up and itch. And then there are words like "interesting," which she's not really sure how to feel about. Now, at age twelve, she's starting middle school, and just when her friends who used to accept and protect her are drifting away, she receives an anonymous note saying "I know who you are, and I know what you're dealing with. I want to help." 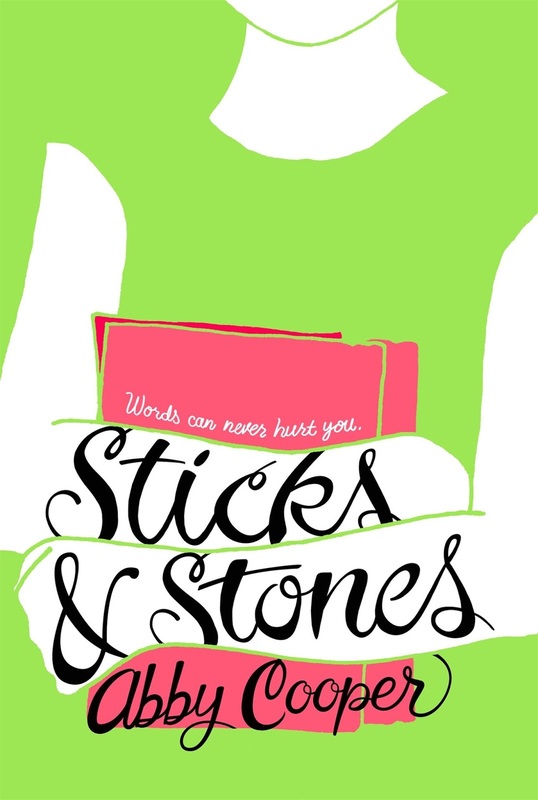 As Elyse works to solve the mystery of who is sending her these notes, she also finds new ways to accept who she is and to become her best self." Okay, so I'm a bit behind the ball on this one, but I'm finally getting around to it! This definitely has an interesting plot line (it'd seriously be tough to have adjectives all over your body! ), but the overall story is a common one: the transition to junior high and what that means for one's self and friends. The mysterious notes and Elyse's own monthly goals drive the story and her character's development. It pulls you in and gets you invested. However, a lot of the other characters felt pretty flat--parents, friends, enemies, etc. Granted, at the end, there were some needed delvings into these characters' lives, but they felt hollow amisdt all of the other bows being tied. That is to say, a lot of it wrapped up a bit too perfectly by the end. But! I promise these are some pretty nit-picky criticisms. I still appreciated the lesson this book teaches in learning to appreciate one's self as well as how teachers can be a great influence in students' lives. It's pretty reminiscent of Fish in a Tree and Wonder.